What is actually there in the picture to look at in Marianna Veremi’s abstract paintings? First of all, falling curtains. Falling in seven works of art – the artist’s tribute to her mother’s circle of life. The end of this circle, a year ago, triggered the eruption of extreme yet complementary experiences and emotions in the artist, now emerging in public display in this exhibition. Eruption (p. 10), Circuits (p. 12), Emergence (p. 13), Theatre of Life (p. 11), Adaptation (p. 8), Reconciliation (p. 9), and Chrysalis (p. 4), are all inspired by the emotions reflected in their titles, which become the more vivid the more we gaze at them. Eruption, for instance, evokes in the viewer’s memory the fragmentation of the body, the outer shell, due to a release of inner pressure, or to a sudden passionate emotional outpour. On the other hand, Emergence captures on canvas the notion of Nemesis. It conveys the emotion of coming out of the darkness, becoming visible once more, emerging into the foreground, from the depth to the surface. Marianna Veremi felt the urge to produce seven paintings so as to express the end of a life-performance that was of great importance for her own life. The number was not a conscious choice; rather, it was made with her heart. The number seven, however, is not a random number; it is suggestive of ideas in the artist’s subconscious. In his well-documented article in Tachydromos magazine, Theodoros Perrakis characteristically writes, “In the history of nations, in religion, music (Byzantine and modern), in the arts, in the evolution of medicine and the human species, even in the unfathomable scale of the universe, from antiquity to date, the number seven was astonishingly regarded as an indivisible, sacred number by almost all the peoples on Earth”. Marianna Veremi’s quality of work, her personality and moral integrity, have all been praised by eminent intellectual figures. Former president and now member of Aica Hellas, Efi Strouza, notes that, “Through her art, [Marianna Veremi] contributes a lucid, personal voice for the longing of depth”. 2 Nikos Kazantzakis, The Saviors of God: Spiritual Exercises, trans. Kimon Friar, Simon & Schuster, 1960. Web, 02 Feb. 2015 <http://www.angel.net/~nic/askitiki.html>. Maria Migadi curated the solo exhibition of artist Marianna Veremi "Curtains" in February 2015 at the Tsichritzis Foundation for the Visual Arts in Athens. As the curator of the exhibition stated in the exhibition's catalogue introduction "What is actually there in the picture to look at in Marianna Veremi's abstract paintings? First of all, falling curtains. 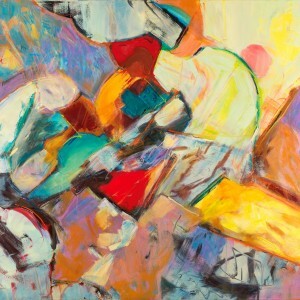 Falling in seven works of art- the artist's tribute to her mother's circle of life".